Dina is also looking for this clown, with or without the Les Petits patch. I’m looking for an Applause no 17064 Marcel large primary colored clown. It is red, yellow, blue and green in color and about 19 inches long, with Les Petits written on an embroidered patch over his heart. 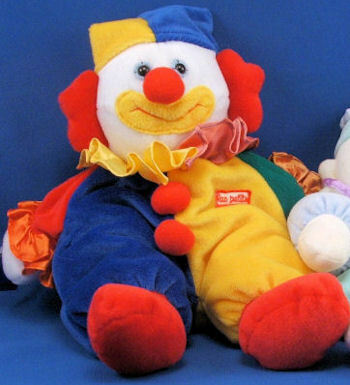 My daughter has had an Applause plush Marcel clown since she was a baby and now is 18. A dog has badly damaged it, and she is desperate for another. ebay #251277296489 Think this is the clown but may be a larger version. Here are three more options. im sure youve found one by now. but this is amazing, i have had this same clown since i was a baby. I am now 21 and his still my best pal. glad to see im not the only one. ebay #161220721128 appears to be the clown with patch. Good luck! I have this clown in my possession with tags. Please let me know if you are interested.